I have had the rug for just about a month, and I'm quite pleased with it so far. It is beautiful, extremely soft, and is very well constructed. My dog (a LARGE guy) chose twice to christen it by upchucking the entire contents of his stomach. I used water and then a powdered oxygen cleaner to fix the disaster. You honestly would have to know it happened to find any spots. This is amazing considering the color. The only thing that would have made it a better choice would have been if it were offered in a 10 ft. round size. 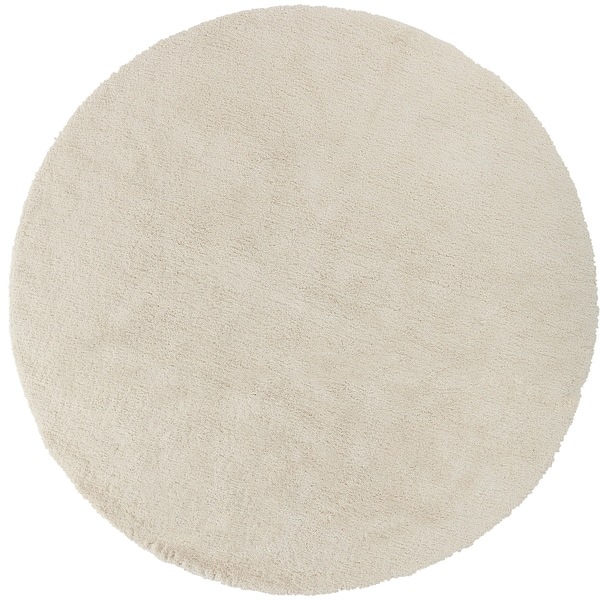 Hand-woven from polyester this rug features a casual design with a ultra plush. This rug will really tie your room together. Dimensions 96.0 In. X 96.0 In. X 1.18 In. "Is this a 'white white' rug or off white. I'm really looking for a very white rug." Hello norcalcoastalbuyer2014, the color is more off-white in my opinnion. We try to represent the colors of our products accurately. Unfortunately, due to the difference in monitor colors we cannot guarantee that the color will match exactly what you see on your screen. Thank you for shopping with us. "Is it shimmery or more matte colored?" Hello osn1234, we appreciate your inquiry. This is more of a matte color, with a slight sheen. We hope you have found this information helpful. Thank you for shopping with us!